Reputed manufacturer, supplier of Modular Office Partition. Our product range also comprises of Modular Kitchen Furniture, Residential Furniture and Modular Office Furniture. 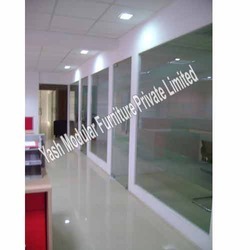 Providing wide range of modular office partition at competitive prices. We design these products as per the industry norms by using the high grade of raw material & technology. We have the experience and acumen to manufacture and supply a wide array of Full Height Partition. These products are tested as per the international standards of quality by our team of skilled and trained professionals before itis delivered to our clients. We also manufacture a wide range of these products in a customized form as per the requirements and specifications of our prestigious clients.